Atoms and God’s favor equals……everything! When considering the atomic basis of everything, did you know that the state of matter as a solid is an illusion? Atoms have electrons spinning around their nucleus at around 1,350 miles per second. Atoms are so small that about 5 million-million hydrogen atoms fit on the head of a pin. How many atoms do you think make up the table that you are sitting at or the chair your sitting in? Atoms are so small and spinning so fast that to us they seem as though they are solid and still. Next time you look at your kitchen table or the screen that holds the letters you are reading this on, you will know it is made up of moving atoms! Being that atoms comprise the basic composition of matter, I think it is fascinating that science is just beginning to understand how atoms are being held together.. They know how molecules stay together through various bonds which are made up of atoms connected together through opposite charges, but at the atomic level, they are just beginning to understand what holds the atoms themselves together. If you think back to your high school science or chemistry class, you may remember learning that like charges repel one another, while opposite charges attract. 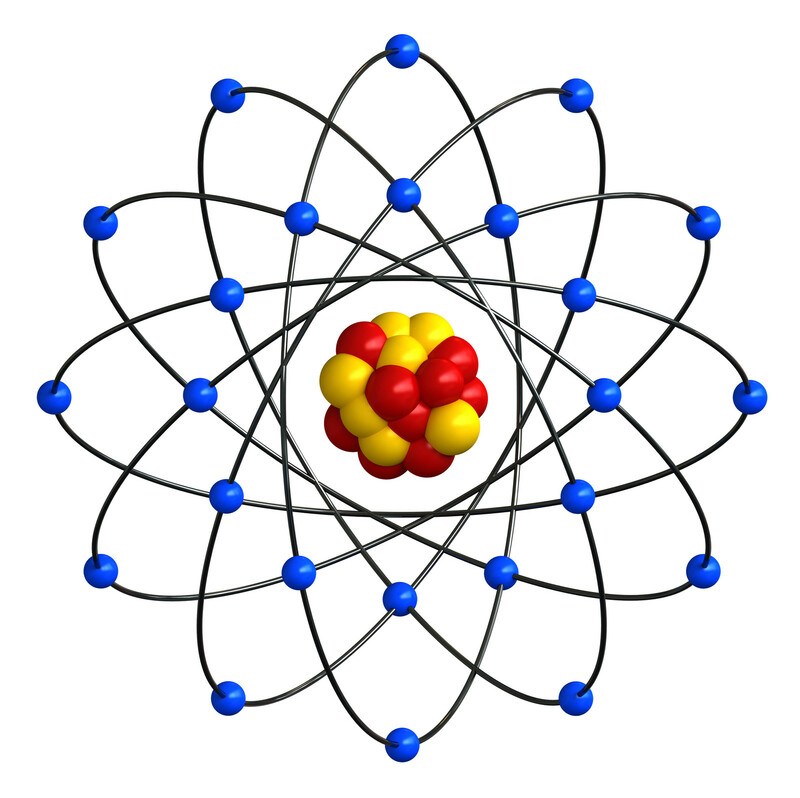 The center of the atom or the nucleus is made of positively charged protons and neutrons which have no charge. How then do the protons in the nucleus of an atom stay together when they repel each other because of their like charge? The scientific community is beginning to understand this phenomena, through quantum physics. The answer is, as Colossians 1:17 says, Jesus holds all things together. I am not saying that when science is able to see the nucleus of an atom, they will not be able to prove their brilliant theories of how God, the creator of the laws of science, is holding the atom together; what I am saying is the principle is Truth. God holds all things together. How much more encompassing could “all things” be then at the atomic level? This means that everything surrounding you, even you yourself, God has His hand on and is intimately connected to in that He is holding all things together. As it states in Romans, the qualities of God are evident in everything which includes me, you, and our lives. Romans 1:20 (KJV): For the invisible things of Him from the creation of the world are clearly seen, being understood by the things that are made, even His eternal power and Godhead; so that they are without excuse. The Bible says that if we abide in Christ, whatever we ask God will give us (John 15:7); that He will give us the desires of our heart (Psalm 37:4). I think most Christians know this, but do they really know how to access this abundance of God and His prosperity? Do we really know how to make these verses applicable to everyday life? Do you realize you have everything in Christ because He has created everything and He is in everything? To answer these questions, we will look to the story of Jacob and Esau. If you recall in the story of Jacob and Esau, Jacob stole Esau’s birthright by deceiving his father into blessing him as the firstborn (Genesis 27). In this blessing from his father, Isaac, Jacob was blessed with the dew of heaven and the richness of the earth. Notice which blessing is first, the dew of heaven. When studying the Bible, an important concept is the Bible interprets itself. To find what the dew of heaven is, we will look to Proverbs. Proverbs 19:12: The king’s wrath is as the roaring of a lion; but his favor is as dew upon the grass. When Isaac blessed Jacob with he dew of heaven, he blessed Jacob with the favor of God! We all know that dew comes in the morning. This means the the first fruits of God’s blessings, the greatest blessing you can have is being in God’s favor! In His favor, you have everything! Because Jacob received the best blessing, Esau’s blessing was to dwell in the dew of heaven and richness of the earth. Jacob was blessed with the dew of heaven, Esau was blessed to dwell in it. When Esau came to Jacob in Genesis 33, we see the results of these blessings. Jacob was afraid of Esau cause when Jacob fled after stealing the birthright, Esau wanted to kill him. So knowing Esau was coming, Jacob sent a significant amount of gifts to get in Esau’s good favor. When Esau saw this, he said “I already have plenty, my brother. Keep what you have for yourself. (Genesis 33:9)” In this verse, the Hebrew word for ‘plenty’ is “rab” and means much, or a lot. In contrast, Jacob replied with, “Please accept the present that was brought to you, for God has been gracious to me and I have all I need. (Genesis 33:11)” In this verse, the Hebrew word meaning ‘all I need’, is “kol”, and means EVERYTHING! Jacob was blessed with God’s favor, and it brought Him everything. Despite Jacob being practical, He understood that with Christ He has everything. In this same verse, grace is used for the first time. When you are in God’s favor, you are in His grace. In His grace is abundance and prosperity in which God will give you the desires of your heart. Because God is in everything, and He is in you and you are in Him (John 14:20). YOU have access to what He has. You have everything when you are in His favor! Next Post How to Know You’re Living In God’s Presence!